It's a topic that would probably make the average individual's eyes glaze over, but will have a profound impact on the economy - for better or worse. The topic - financial regulation reform. With Senate Banking Chairman Sen. Chris Dodd, D-Conn., setting his proposal out for the public, the take away on the reporting from two of the country's major newspapers - The New York Times and Wall Street Journal can give readers a view where their reporters' loyalties lie. On CNBC's March 15 "Squawk Box," co-host Joe Kernen raised this point - the Journal with its more pro-Wall Street point of view and the Times with a liberal pro-Democratic Party one. "You - I like the way you highlighted the Journal's take, ‘Ohh, this thing is ahh, much worse,' but The New York Times - ‘consensus-building,'" Kernen said. "But The New York Times is talking about consensus-building within the Democratic Party, I think, right? I mean, normally that's who they're speaking to, isn't it?" In an unfortunate choice of articles, MSNBC earlier had a featured set of headlines in their politics section regarding the stimulus package and its effect on the troubled job market. 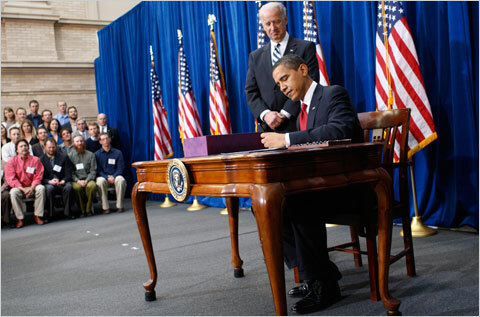 One article touts the recent White House claim that the stimulus package had saved 2 million jobs. But the other article explains why a new method of accounting adopted by the White House will make it "impossible to track the number of jobs saved or created with the $787 billion in recovery money." 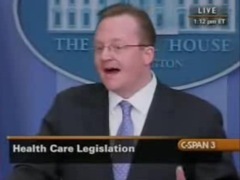 Given the generally sycophantic attitude of the White House Press Corps, Robert Gibbs may have been caught off guard when he started facing some tough questions on President Obama's apparent flip-flop regarding his many promises to broadcast health care negotiations on C-SPAN. Gibbs stubbornly refused to answer multiple questions about the broken promises (h/t Byron York). Naked Emperor News complied video clips of eight instances of Obama promising to broadcast those negotiations on C-SPAN "so that people can see who is making arguments on behalf of their constituents, and who are making arguments on behalf of the drug companies or the insurance companies", as he said during one speech. The President has reneged on that commitment by reportedly encouraging Congressional leaders to skip conference committee negotiations. C-SPAN CEO Brian Lamb recently sent a letter to the President and Congressional leaders "respectfully request[ing] that you allow the public full access, through television, to legislation that will affect the lives of every single American." That request went unheeded. The White House might want to rethink its position on Fox not being a real news network after what happened during Saturday's historic debate and vote on healthcare reform. Consider that as far as cable is concerned, with the exception of C-SPAN, only Fox aired House Speaker Nancy Pelosi's speech live as it was happening. "When I watch the news people stand here and tell me that I am a member of a hired mob, that I've been called up by the Republican Party, they only wish they could have done something like this. I've never been contacted by any organized group." So fabulously stated a caller during Saturday's "Washington Journal" on C-SPAN in a monologue that is likely to go viral throughout the Internet and possibly make the speaker America's next Joe the Plumber. 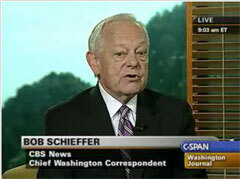 Appearing on C-SPAN’s Washington Journal Tuesday, CBS Face the Nation host Bob Schieffer dismissed the notion of liberal media bias: "...there is so much media out there now that the idea of bias in the media, it’s almost become irrelevant. I mean, we’re in this age of opinion journalism, where you can get the news served up almost anyway you want it." Schieffer went on to compare biased media coverage to ordering eggs: "If you want to hear it from a conservative point of view, you can find plenty of places on the dial to get that. If you want to see it served up from a, you know, a no apology liberal point of view you can get it served up that way. It’s almost like going into a restaurant and ordering eggs, you can get them sunny side up, scrabbled, with a little Jalapeno pepper if you want it." Clearly, CBS has routinely served up news coverage with a distinctly liberal flavor for years, the latest example being CBS Early Show co-host Harry Smith conducting a fawning interview with President Obama in which he asked the President where he "learned to love" and about the behavior of the White House dog. On Wednesday’s Countdown show, the duo of MSNBC host Keith Olbermann and new CNBC contributor Howard Dean delivered a gem of both double standard and apparent amnesia as both generalized about the inappropriateness of calling any President a "fascist." As Dean was interviewed by Olbermann, who famously called President Bush a "fascist" in a "Special Comment" rant last year which was even picked up by Iranian television, the former DNC chairman bluntly stated his view that even President Bush did not deserve to be called by such a name. And just as Olbermann seemed to be trying to defend his own history of applying the "fascist" label to Bush, which he did not directly acknowledge, even he stopped short of proclaiming outright that such name-calling could sometimes be rational, as he contended that a person doing so "may be crazy" and "may be wrong." Olbermann: "If you have a case to call somebody a ‘fascist,’ lay it out. Define your terms and say where you, I mean, you may be crazy and you may be wrong, but at least put some meat on the bones." 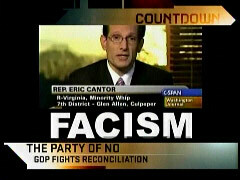 Dean's response: "Even in the darkest days of the Bush-Cheney administration, I don't think there was any reason to call George Bush a fascist." Director Ron Howard appeared for a C-SPAN Washington Journal interview Monday morning on Capitol Hill with British screenwriter Peter Morgan to discuss their new film Frost/Nixon, based on Morgan’s play on the 1977 interviews between British TV star David Frost and the Republican president who resigned. The jarring moment came near the end, when C-SPAN host Steve Scully asked "For a generation who doesn’t remember Nixon or these interviews, what do you want them to come away with?" I suspect that this broadcast tonight -- and maybe some others on this channel -- are the only ones who are going to make a headline out of this. This is not going to be a big story elsewhere. As Hume predicted, CBS’s “Evening News,” NBC’s “Nightly News” and ABC's “World News Tonight” did not mention the story in their broadcasts that night. A woman, calling into C-Span’s morning show Washington Journal used the c-word as part of her reasoning as to why John McCain shouldn’t be president. Apparently C-Span does not use the 7-second delay for its live programming, though the host of the show did immediately end the call after the obscene word was uttered. The call came just before 9:00 a.m. on the July 7th broadcast during the show’s call in segment. The call in segment allows viewers to voice their opinions on any topic. Female Caller: I have two points. McCain is really too old for this job. We need somebody that can keep up. And number two. He does not have respect for women. He even called his wife a c---. Peter Slen: (ends call) Let’s move on. For video of this click here, pertinent clip is at 2:54:36.